Most guys, including you probably would like to use iPhone Reminders to make daily schedule and have the alarm to inform them of important call, appointment so that they can't miss these upcoming events. If you unfortunately delete your reminders on your iPhone, how to recover them? This simple tutorial will introduce you possible ways to retrieve deleted reminders from iPhone easily as you want. 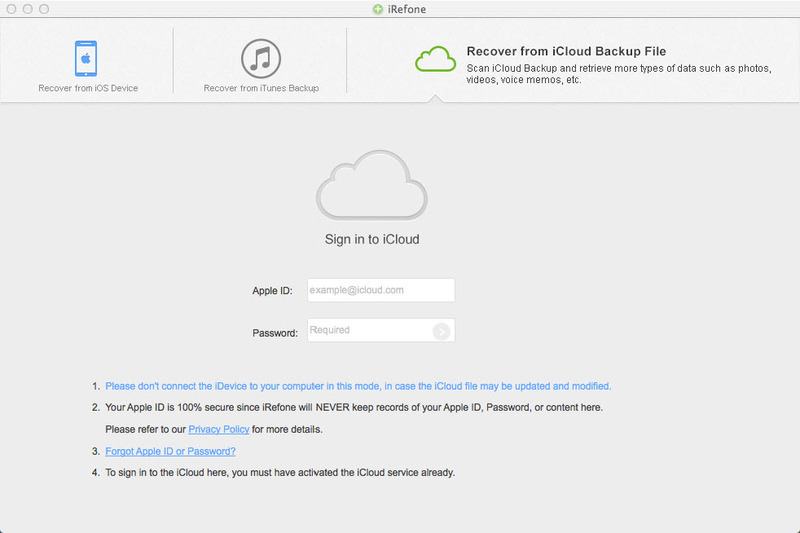 Apple offers us two ways - iCloud and iTunes to backup and restore device so that we can easily recover deleted files and data although, this is limited to that you have made backup before losing files and data. Moreover, restoring iPhone means all the data in your iPhone will be replaced by the contents in the backup. Is there any better way to recover deleted reminders on iPhone? Definitely Yes! 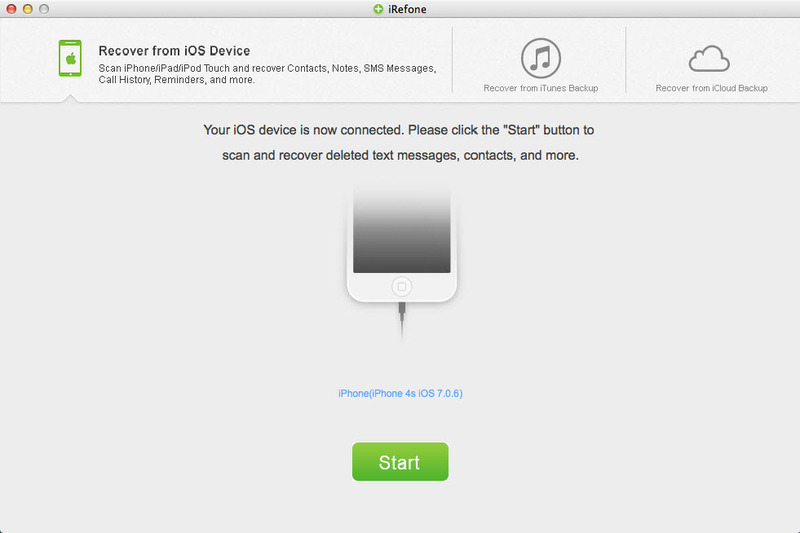 What you need indeed is a powerful iPhone data recovery tool - iRefone for Mac. It is developed to help users recover deleted files and data on iPhone, iPad and iPod touch. 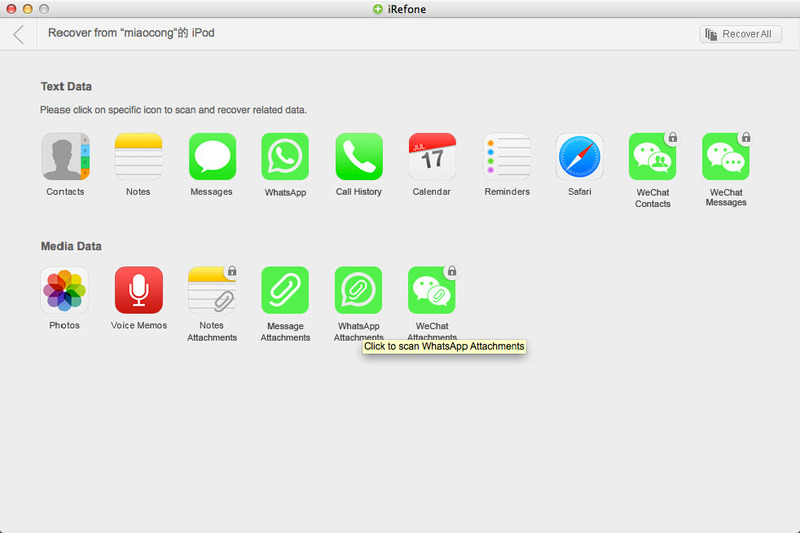 It is able to recover deleted data like calendars, notes, contacts, iMessages, WhatsApp messages, voice memos and more. Also, if you have an iTunes or iCloud backup for your lost data, it can help you extract and restore lost data from backup selectively. If you are on Windows, please turn to iRefone. Now download the program and learn how to recover lost reminders from your iPhone 6s Plus/6s/6 Plus/6/5s/4s/4. Run iRefone for Mac and connect your iPhone to the computer. Then you can simply click on the "Start" button to access the data in device. "Recover from iOS Device" mode is selected in default. All the files include reminders, contacts, messages, call history, calendar, notes, Safari Bookmark stored on you iPhone will displayed in the windows. Click on Reminders to scan. After automatic scanning, you have the chance to browse those found reminders and then, select what you need to recover. You can easily save them on your computer by clicking the "Recover to Mac" button. 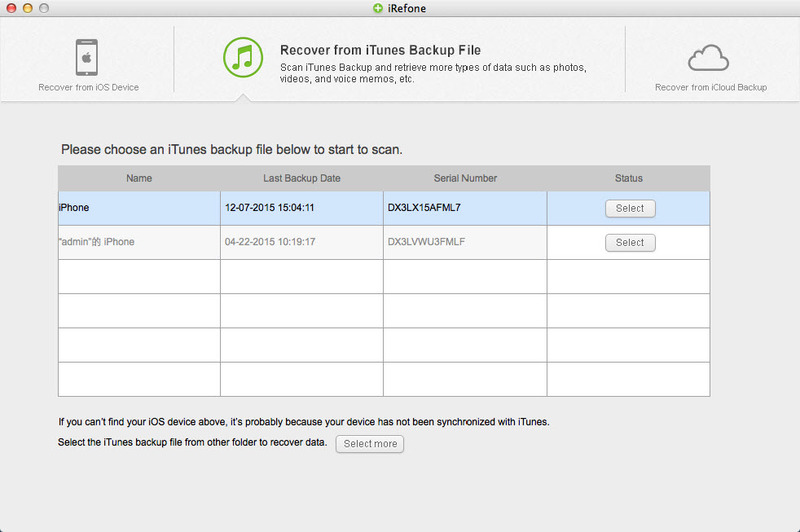 Choose "Recover from iTunes Backup" on the main interface. All the iTunes backup files of your iOS Device which has ever synced with iTunes on this Mac will be automatically found and listed here. You can choose the one you want and click "Select" to access the data interface. Enter into the interface to show you all the data categories in your backup. Select the Reminders to preview. The scanning time depends on the database in your iTunes Backup. After the scanning, check and preview your iPhone reminders, then proceed to save them on your computer with one click "Recover to Mac". 1. Run iRefone for Mac. Choose "Recover from iCloud Backup" mode. Please sign in with your Apple ID and password, then choose one iCloud backup file containing your lost messages to download and start. You need to make sure that your Apple ID has been activated. 2. Check Reminders box to download the reminders from your iCloud. 3. Scan reminders from downloaded iCloud backup. Click on Reminders item to begin. 4. Preview and choose lost reminders to restore. You can select lost reminders to restore on your computer via clicking "Recover to Mac" button to finish the whole process.